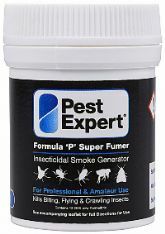 The Pest Expert Formula 'P' Fogger is a moth killing fumigation device designed to control carpet moths. The Fogger works on the same principle as conventional smoke bombs; however, as it is an aerosol it does not require a naked flame, thus eliminating any potential fire hazard, which makes it safer for use in rooms affected by a carpet moth infestation. 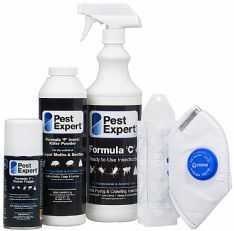 The Pest Expert Formula 'P' Fogger is an important part of a comprehensive carpet moth treatment, although as it has no residual value once the gas disperses, to achieve complete eradication it is best used in combination with carpet moth killer products that provide longer-lasting protection, such as Formula 'C' Carpet Moth Spray. Please also see our Carpet Moth Killer Kits, which contain a range of moth control products and come complete with an advice sheet including step-by-step instructions on how to carry out a successful carpet moth treatment. Very efficient service and the product has worked as expected. A very useful little device when you've got several moths in one room! Seema to be very effective and easy to use. Ordered and arrived 2 days later. Great service, great delivery and now I hope great product. COULDN'T BELIEVE HOW QUICK THE ORDER WAS DEALT WITH AND DESPATCHED , I ALMOST HAD IT BEFORE I ORDERED IT !!!! WILL DEFINITELY USE THEM AGAIN . We'd been having serious problems with an infestation of carpet moths. We tried "cheaper solutions" like the pheromone pads which had no impact whatsoever. We purchased several Formula 'P' Foggers from mothkiller.co.uk, and set them to go off in each room while we went away for a week. We returned to find hardly any trace of moths at all. The odd one is still appearing, but to all intents and purposes, this product has been a huge success. I bought the carpet moth killer kit and it worked a treat thank god, no more moths. Easy to apply and a reasonable price. After catching 16 moths in one evening we ordered a fogger. Haven't seen a moth in that room since, so we ordered several more. Delivered in two days and they kept us informed of our order's progress by email. Used the foggers in other rooms and haven't seen a moth since. I was shocked to see so many moths in my wool workshop already flying in march. I let off the canister but realized later that it had not gone off properly. I twisted it properly and it worked, I have not seen any moths flying since! Hope the eggs are dead too. EXCELLENT MOTH KILLING FUMIGATOR!! I THOUGHT THE FORMULA P FOGGER WAS VERY IMPRESSIVE, PARTICULARLY WHEN YOU SET IT OFF. WE HAVEN'T SEEN A CARPET MOTH OR ANY NEW THREADBARE CARPET DAMAGE NOW FOR WEEKS, SO IT'S LOOKING VERY GOOD. WE USED THE FOGGERS TOGETHER WITH A GOOD SPRAYING OF THE FORMULA C CARPET MOTH SPRAY AND IT DID THE TRICK FOR US. I recently bought two Formula P Foggers and a Carpet Moth Treatment Kit Intermediate after finding moths had been eating away at the edges of our living room and dining room carpets. I like'd the way that the Foggers seem to gas the entire room. I'm pleased to say that the pesky carpet moths now seem to have been killed off, although I continue to remain vigilant!